The latest release of SIMSOLID Cloud now includes a very general Remote loads boundary condition. This provides an easy method to apply twisting and/or bending loads to one or more groups of part faces. A new dynamic drag control is used to locate the remote load point. 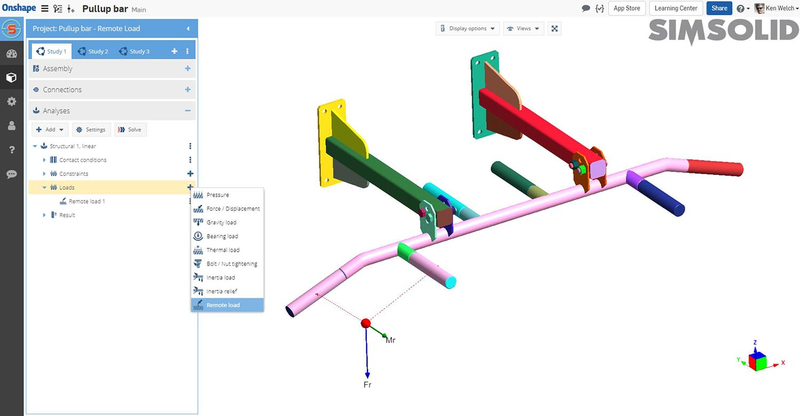 Remote loads work with both linear and geometric nonlinear analyses. In geometric nonlinear, the load can optionally be specified as a follower load. That is, it operates in a local frame that "follows" the deformed part shape. This type of load is often used to account for forces from component fixtures that are not present in the part geometry.